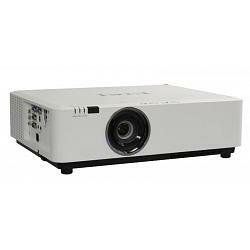 EIKI EK-350U Projector HLD LED 4,500 ANSI lumens bright with 80% uniformity and a 50,000:1 contrast ratio. Native WUXGA resolution. Compatible with inputs up-to UXGA and WUXGA. HDMI with MHL (Mobile High-Definition Link) displays HD Video from Smartphones & Tablets. Convenient mid-range (1.6:1) manual zoom and focus lens. HLD (High-Lumen-Density) LED Light Source. Horiz., Vert. & Corner Keystone Correction. Horiz. & Vert. Manual Lens Shift. Wired network control. Accepts composite, component, and S-Video in all major standards. Displays both 4:3 and 16:9 aspect ratios. Supports most HDTV resolutions. Built-in 10 Watt sound system. Closed Caption decoding (NTSC). 3 year projector warranty. Order in the next 15:12:55 Hours to Ship Today Place your order by 3:30 PM Today and your order will ship the same day. For further details and delivery estimates check our shipping page. Remember to select the desired service level needed in your cart. All orders are subject to verification. International orders are processed the next shipping day.